Shelving is a quick, easy, and affordable way to get organized. Melamine shelving is perfect for utility purposes, while decorative melamine adds the same functionality with the look that complements your decor for closets, work rooms, and pantry areas. Its got a square edge and a finished face, back and one edge. Panels are pre-drilled to accommodate shelf pegs. Melamine shelving provides a more durable surface for heavy use applications such as cabinets, walk in closets, pantries, laundry rooms and garages. Door Hanging Ironing Board is rated 4.0 out of 5 by 26. Rated 3 out of 5 by Curtis from COULD USE SOME ANCHORS AT BOTTOM THE TO KEEP... COULD USE SOME ANCHORS AT BOTTOM THE TO KEEP IT IN PLACE AND MAKE IT MORE STABLE. Rated 2 out of 5 by Delete Queen from Wrinkles need ironing out I have the board hanging on the door but prefer to use my old standing board. The hanging one needs much more padding and the standard replacement pads don’t fit. The shape of the board is too wide at the open end, making it useless for ironing shirt yokes properly. I plan to add more padding and will use it for quick pillow case touch ups. A disappointing product. Rated 4 out of 5 by Mary from Love love love it!!!!... Love love love it!!!! Rated 4 out of 5 by Greg from It works with door/doorframe modifications. Unless you get a conduit clamp/takedown and screw the... It works with door/doorframe modifications. Unless you get a conduit clamp/takedown and screw the ironing board to the door it will annoyingly bang around. See photos. Rated 4 out of 5 by Grammy from exactly what I was looking for. I wish it had some kind of fold up brace on it to steady it a l... exactly what I was looking for. I wish it had some kind of fold up brace on it to steady it a little more. Rated 5 out of 5 by Tina from Exactly what I expected. Hides in closet for small spaces.... Exactly what I expected. Hides in closet for small spaces. Rated 5 out of 5 by Paul from Mounted to the wall for easier use and more stable... 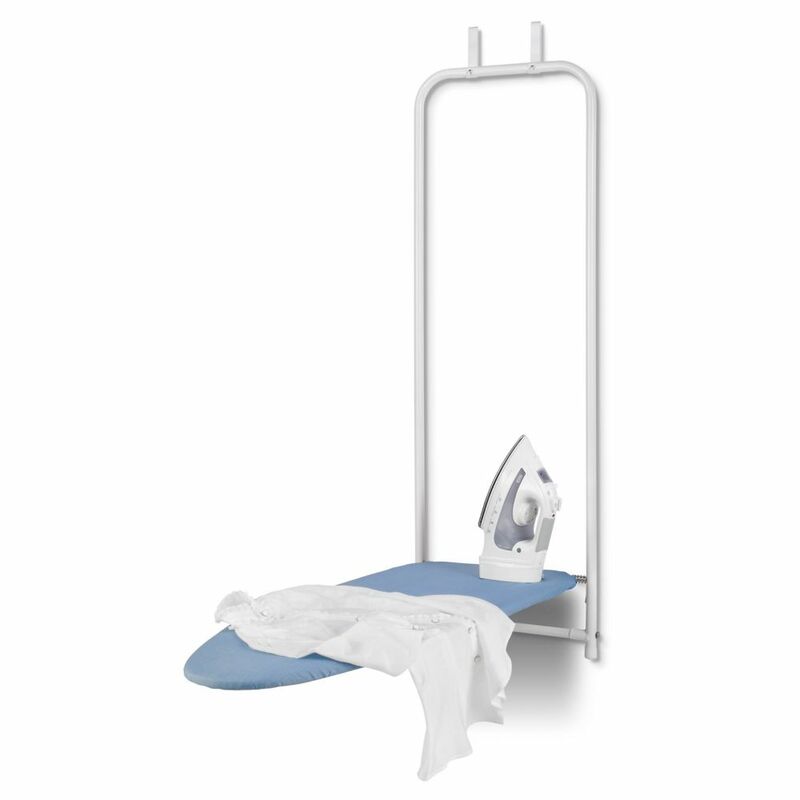 Mounted to the wall for easier use and more stable ironing.